A large portion of our accent reduction clients are looking to enhance the efficacy of their verbal business communication skills. 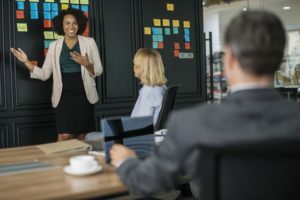 While our expert staff of Speech-Language Pathologists can help with accents and pronunciation, there is a great deal many more pieces to effective business communication. Listen. And Listen Good. Being a good listener is imperative to good business communication. To achieve this, remove all distractions, focus on the person speaking, and wait to develop your own response until they are done speaking. If you are focused on waiting for your turn to speak, you will miss what they are saying. Being a good listener develops strong relationships with clients and colleagues. Pay Attention to Nonverbal Communication. Body language and facial expressions are important to observe when others speak and are even more important to be aware of when you speak. Make sure your body is conveying the same message as your words. Strong Emotional Intelligence. Being aware of your own emotions and those of others around you is vital for interpersonal interactions and communication. Being aware of current emotional states and the reasons for them can help you communicate with empathy, which increases your effectiveness in professional settings. Good Manners. Be polite. Ask, don’t order. Use please and thank you. Every interaction goes smoother if you use good manners in communication. Use Inflection to Emphasize Points and Maintain Attention. A lengthy monotone discussion makes it difficult for a listener to pay attention. Use variations in your vocal inflection to emphasize important points when communicating in any business setting. Be Clear and Concise. Attention spans are short and clarity is key. Find the most concise and simple way to express what is needed to make your point. Speak with Confidence. Build trust and respect by sounding confident when you speak. This means strong body language, word choice, tone of voice, and eye contact. Avoid “I think” so you can speak matter-of-factly. And if you are not feeling all that confident, fake it until you make it. Confidence will come as a result of your audience’s reaction to your perceived confidence.